A fully automated solution, the LW2 is the most complete laser marking station on the market. Ergonomic and easy to use, this laser station makes it possible to quickly carry out all types of marking (texts, Datamatrix codes, logos, etc. ), from single marking to large series. 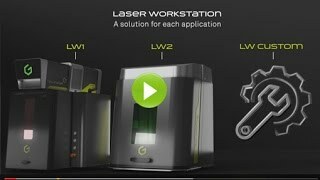 The top model of the laser station range, the LW2 laser marking station is the solution for all your markings: benefit from a complete, productive workstation that can be adapted to your applications and specificities. Equipped with a 180x280mm viewing window, the LW2 marking station allows you to view your markings in real time without any protection required. Available with all lasers in the range: Fiber, Hybrid, CO2, Green, this station allows surface marking as well as deep engraving. Equipped with an automatic door and dedicated software, and delivered with its remote control, the LW2 is a fully automated solution: closing the door, marking, opening the door are done by simply pressing the button on the remote control (door opening/closing time: 1.5 sec). Certified class 1, equipped with the complete "interlock" locking system and anti-pinch sensors, the LW2 guarantees you safe marking. The software provided with the LW2, Lasertrace™, allows you to control your laser in manual mode, or to switch to production mode: optimize your productivity thanks to the semi-automatic or automatic levels that make your marking station a totally autonomous industrial station. The LW2 has a motorized Z axis and can be adapted to all your parts regardless of their height, length and position (up to 365mm high and 558mm long). Its large work surface can accommodate tools and fixtures of all types and sizes. Z axis controlled by autofocus: a rangefinder measures the distance between the surface to be marked and the laser head. After changing the part, the Z axis will be controlled until the nominal working distance is obtained. The operator's tasks are totally simplified: he no longer has to intervene for marking, whether before, during or after. Forget the painful and repetitive gestures thanks to the automatic door: save time and gain in productivity! Delivered as standard with each laser marking station, Lasertrace™ allows you to create your marking sheets in a few clicks. 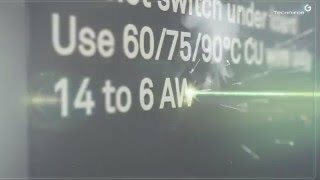 Laserstyle™ is a software developed by our experts, which allows the optimal control of your laser station. How it works Software specialized in traceability and manufacturing process. Driving software oriented creation and design.